The focus for tonight's meditation, through 8pm GMT is the second of a set of three focusing on helping all in distress across the globe using the amethyst cairn, here at Old Nisthouse, Orkney. We hope you are able to join us. 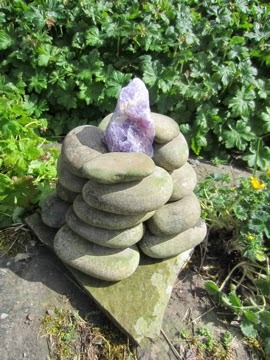 Please feel welcome to connect to the cairn at any time to help all in need through meditation, prayer or positive thought. Tonight's meditation, through 8pm GMT, focuses in helping all in distress across the globe using the amethyst cairn at Old Nisthouse here in Orkney. Hope you are able to join use in meditation, prayer or positive thought. This cairn remains open for this purpose continually unless other wise specified so please feel free to connect to it at anytime, to help others in need. This meditation will use the heart shaped chunk of rose quartz show below. Hope you can join us through 8pm GMT. We are delighted to announce that Crystal Earthworks is sponsoring the planting of 33 beautiful aqua aura crystals. These crystals are shown below and have been programmed in connection with our Global Aqua Aura Planting project. This project's aim is to plant specially programmed aqua aura crystals to places of high energy and spiritual connection across the globe, enhancing these energies. Several of these crystals have already been taken to India, one has gone to Spain and a further one is on its way to Greece. If you would like to take part in this project and feel drawn to a special place to plant one of these crystals (see Aura Planting Projects page for further details), please get in touch. The crystals and postage are free of charge and come with full planting instructions, no crystal planting experience necessary! Hope you can join us using the image of the crystal cairn at Old Nisthouse here in Orkney as a focus for meditation, positive thoughts or prayers. Thank you. 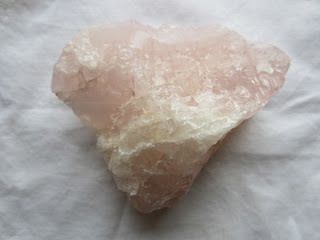 This meditation will use the heart shaped chunk of rose quartz show below.